Coving.ie a leading manufacturer and supplier of coving in Ireland. We manufacture all our coving and centrepieces in our workshop and we fit the moulded products in every county in Ireland. Take a look at our products page to see how we can make your house more beautiful. Coving is a type of decorative plaster moulding which creates a beautiful transition in the space between the ceiling and walls of a room. It forms a concave design which curves inwards to the wall. Coving adds beauty and elegance to any room. When you want to transform your home or business premises in Mayo, by adding that special touch of elegance, let us show you what we can do to achieve this. 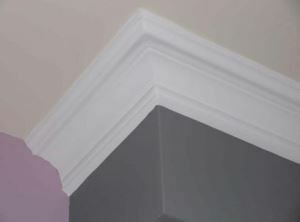 We provide decorative moulding products to both residential and commercial customers and also offer a supply only service to tradesmen who want to install the moulding products themselves. Our plaster moulded centrepieces add a focal point to the ceiling of any room. The centrepiece will complement a light fitting or a cornice in the ceiling of any room. Have a look at our ceiling centrepiece range, and choose one that will truly transform your living space. If you are interested in our county calling service or require quotation for work to be completed in Mayo, contact us today! You don’t pay until you are satisfied with our work. We also offer a wide range of complementary services such as dry lining, installation, repair work, painting and plastering. Call Eamon at 087 2368158 for a free quote today!